David Cameron, Prime Minister of the United Kingdom, is in a bind. Not because recent opinion polls put his party a dozen points behind Labour and not even, really, because the British economy continues to splutter along in search of a long overdue recovery. The second of these factors accounts for the first and Cameron trusts that his economic policies will, in time, pay a dividend. No, the Prime Minister is in a bad spot because, on Friday, he travels to Amsterdam to give a much-trailed, long-awaited, keenly-anticipated speech outlining his latest view on Britain's relationship with the European Union and the terms upon which his country can remain a member of the great European project. Since Conservative divisions over Europe played a part in destroying the careers of the last two Tory Prime Ministers (Margaret Thatcher and John Major), Cameron is understandably keen to avoid repeating their fate. Yet there seems every prospect he will, not least because Cameron's party has moved to sharply to the right in recent years, becoming markedly more "eurosceptic" than it was in the Iron Lady's heyday. Cameron's speech has been so long awaited that it seems most unlikely to be judged a success. What remains to be seen is who will come away disappointed, and how badly. Cameron's main success has been to avoid addressing the issue until now. He can't help but be bullied by his party over Europe. To put it in American parlance, there is something of the Tea Party about the Tory eurosceptics—and in his efforts to placate them while retaining some dignity, there is something of John Boehner about poor Mr Cameron, too. His own preferences count for less than he might consider ideal. His party has him on the run and they know it. A poll of 1,500 Conservative grass-roots activists published this week found that 38 percent of the Tory party's keenest supporters want to leave the EU entirely while another 40 percent only support membership if Britain's relationship with Europe is redefined as access to a common market and not much else. A poll published this week reported that one in ten Conservative supporters at the last election have switched their support, for the time being at any rate, to the UK Independence Party—a once fringe group whose principle policy is British withdrawal from the EU. As an indication of the way the political wind is blowing, UKIP has, according to some recent polls, supplanted Cameron's coalition partners the Liberal Democrats as Britain's third most popular party. That is, the most eurosceptic party is now more popular than the most europhile grouping. As Cameron considers himself a "practical eurosceptic" he finds himself in a minority within his own party—a fact that his fellow Tories have been at pains to underscore. Cameron met a backbench delegation on Wednesday who again stressed that the choice put to the people at some point in the next parliament should be between withdrawal and whatever "renegotiated" terms of membership Cameron has managed to extract from Brussels; the status quo is not an option. So long as Cameron supports British membership of the EU there is nothing he can do to satisfy the "Better Off Out" brigade. He knows this and they know it too. Hence his avowed determination to "renegotiate" British membership of the EU. Only this week, the Jyrki Katainen, Finland's Prime Minister, observed that "The EU without Britain is pretty much the same as fish without chips [ie, fries]. It's not a meal any more. When looking at the single market, or free trade, or Europe's competitiveness, in all those issues, we need Britain." Similarly Frans Timmermans, the Dutch foreign minister, said his country's preference was to "do everything we can to keep Britain on board" since it was in the Netherlands' interest to work with Britain "for important reforms in areas where they've always been our allies." So Britain is not as friendless in Brussels as her virulently eurosceptic press would have the British people believe. But even friends' patience can be exhausted. There are signs that, regardless of how sympathetic the Finns, the Swedes, the Dutch or the Poles may be and no matter how much they appreciate the bind in which Cameron finds himself, there is a limit to what they are prepared to concede to Britain. As Katainen put it, when it comes to the repatriation of powers, "you cannot kind of pick the raisins out of the bun". For their part, the Dutch government is equally unimpressed by British attempts to bypass areas of EU legislation and regulation deemed hostile to British interests but that, on the continent, are often considered vital parts of ensuring the common market operates fairly as well as freely. The idea, popular on the British right, that Britain only signed up to a "common market" has made the notion of a Swiss or Norwegian style relationship with Brussels seem attractive. Neither country is a member of the EU but each has a free trade relationship with the 27 member states of the EU. Pleasing as this sounds, Norway and Switzerland still have to abide by many EU laws and regulations but have little to no say or influence on the writing of those directives. Britain would find itself in the same position. The fantasy that Britain can dictate its own terms to Brussels and not be bound by any EU law is a fantasy that is not made any more realistic the more frequently it is posited as Britain's ideal. Enchanting as a life in a single market sounds it is, alas, more complicated than that. Markets—even open, free and liberal markets—have rules. And rules beget regulation. Which must be obeyed. There are few obvious solutions to Cameron's dilemma. The longer he equivocates the greater the calls for withdrawal become, but any attempt to make the case for Britain's active role as a proper member of the European project is liable to be met with derision by much of his own party and most of the conservative press. Moreover, the promise of a referendum makes British withdrawal from the EU more likely than it would have been before the promise was made. The only way for Cameron to come out on top would be to issue a threat he does not want to carry out and have that threat taken sufficiently seriously by his remaining friends in Europe that they will agree, even at some cost to themselves, to allow Cameron to buy off his own party. It is not obvious why the French (or even the more sympathetic Germans) should agree to this. 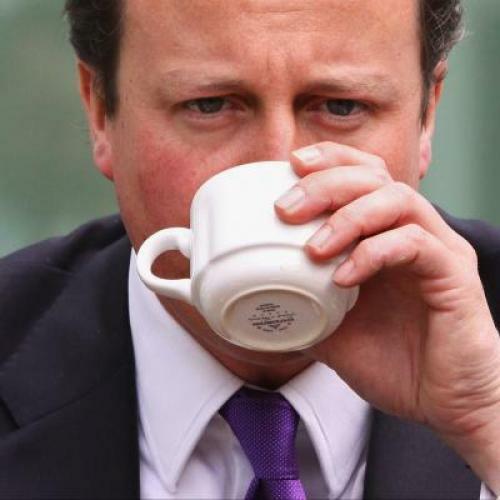 Cameron wishes Britain to remain a member of the EU but he is going about ensuring that in a dashed peculiar fashion. But out of the crooked reality of Britain's relationship with Europe nothing straight was ever made.